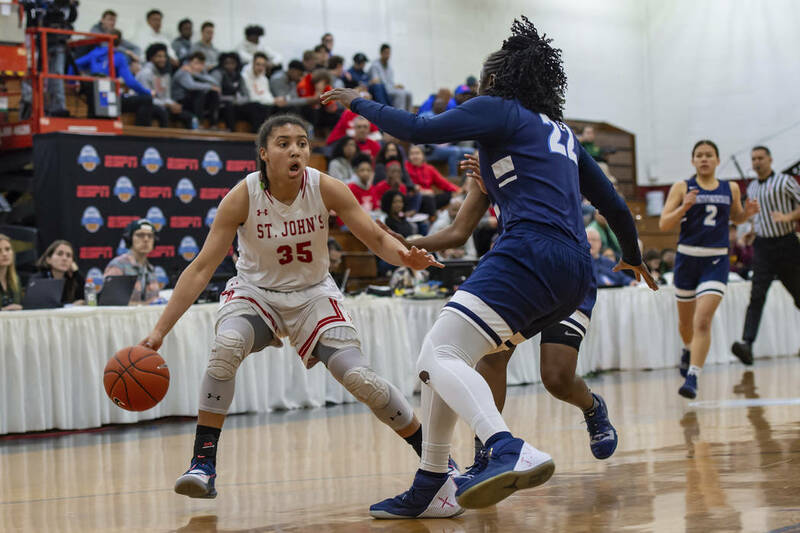 Centennial’s girls basketball team had the lead with less than a minute to play in Friday’s GEICO Nationals semifinal against St. John’s (D.C.). The Bulldogs, though, just 30 hours removed from boarding a near cross-country flight, couldn’t finish. St. John’s (36-1) will meet eighth-ranked New Hope Academy (Maryland) for the title at 7 a.m. Saturday. Fourth-ranked Centennial bows out at 31-2. “The consistency was just not there today on offense and defense,” said Centennial coach Karen Weitz. Centennial missed a potential go-ahead shot with 25 seconds left and fouled Fudd 25 feet from the basket with 8.3 seconds left. The Gatorade national player of the year as a sophomore this season, Fudd hit both ends of the 1-and-1. Centennial worked the ball up the floor, and senior guard Melanie Isbell had an open look at a 3-pointer that hit the front rim. As teammate Eboni Walker battled for the rebound, time expired. The Bulldogs left McCarran International Airport on a 6 a.m. flight Thursday, landed in New York five hours later and hit the floor for a 10 a.m. tip Friday. Still, the team rallied from a 25-16 deficit early in the second quarter and built a 35-31 halftime lead on Quinece Hatcher’s 3-pointer from the left wing with 1.5 seconds left in the first half. Centennial extended its lead to 43-34 on Eboni Walker’s basket with 5:02 left in the third quarter before the Cadets came to life with a 14-0 run. Centennial again battled back, grabbing a 58-57 lead on a Daejah Phillips 3-pointer with 2:39 left. Phillips added a three-point play with 1:51 left that put Centennial up 61-59, but the Bulldogs didn’t score again. The Bulldogs did a fantastic job of containing Fudd in the middle quarters after she scored 10 in the first quarter, but the 5-11 wing scored 10 points in the fourth quarter and finished with 27 points. Walker had 18 points and 10 rebounds, and Phillips scored 15 for Centennial, which was the first Nevada girls team to play in the national tournament.